Patra ni Macchi is the most popular dish in Parsi Cuisine. It is a signature dish traditionally served at Parsi wedding dinners, Navjote receptions, Pateti (Parsi New Year) & other celebratory occasions. This special Parsi preparation is extremely simple, easy, healthy & tastes absolutely divine. This lovely steamed fish covered with refreshing green chutney is a weight watcher’s delight & tastes awesome with Parsi Brown Rice & Dhansak or you can even enjoy it plain. I love Parsi food & so does my family. We very often dine at Parsi restaurants & relish other delicacies too. Besides, we have always enjoyed authentic Parsi food at Parsi weddings & Navjote. You won’t believe this but I must share with you…for me the most soul satisfying experience of Parsi food has been in ‘Jehangir Nursing Home’ in Pune before the hospital was taken over by ‘Apollo Hospitals.’ The hospital was run by the Parsi Trust. It lived up to its name… it was truly a home. The food served was of Five Star quality & would be served in style. You could actually feel like you are put up at a Five Star Hotel! The chefs there were amazing & the service was perfect. It never felt like a hospital. Well, those were the good old days where I had the privilege of tasting great food & the best desserts! Transfer the chutney to a bowl & mix thoroughly with remaining 2 tbsps. of lime juice. Wash fish slices, drain thoroughly. Marinate the fish slices for about 20 mins. with 1 tbsp. lime juice & some salt. Lightly heat each piece of banana leaf for a few seconds on a tawa or on top of the steamer for a few minutes. This makes the leaf pliable so that you can fold it with ease. Brush the smooth side of each piece of banana leaf with oil. Put enough chutney on the leaf & place a slice of pomfret on it. Then layer with enough chutney on top of the fish piece. Drizzle with a few drops of oil. (This is optional). Wrap the fish piece carefully & neatly making sure that it is covered completely with the leaf. 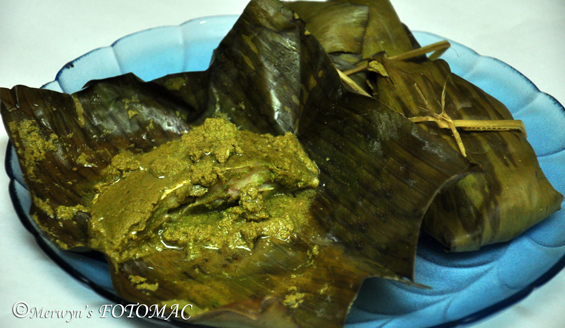 Tie the prepared patra ni macchi parcel with a string/thread or cut the banana leaf spine into thin strings & tie it up. Prepare parcels in this way with the remaining fish slices/fillets. Steam for 15-20 mins in a steamer or bake in an oven.